"I Believe" Breast Cancer Awareness Sterling Silver and Glass Beaded Bracelet. This bracelet is hand crafted and is completely sterling. 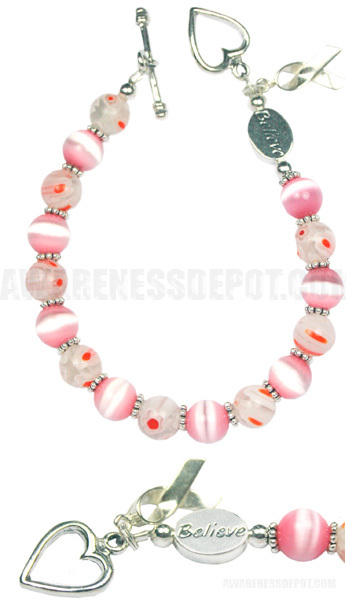 It has sterling silver fixtures, 8mm Cats eye breast cancer beads, 8mm Murano glass beads, a sterling BELIEVE bead, a dangling Awareness ribbon charm and ends with a sterling heart toggle. Show your support and/or courage with this "I Believe" bracelet. No extra charge for special sizing. Make sure to see our full selection of Breast Cancer Awareness products for more great ideas and gifts.